Tuaregs from the deserts of Niger may be better at playing guitar than at marketing their music. How else to account for the confusion between two albums that sound like they could be twins separated at birth? I'm here to set the record straight. In 2007, Sublime Frequencies released the the album Guitars from Agadez (Music of Niger) by Group Inerane. 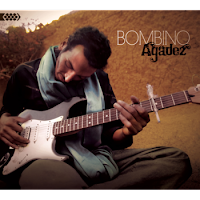 In 2009, they released Guitars from Agadez Vol. 2 by Group Bombino. And in 2010, they were back to Group Inerane with Guitars from Agadez Vol. 3 . Fine so far. Now the label Cumbancha comes into the picture. On April 19, they will release the album Agadez by Bombino. Yes, this is where it gets tricky, so pay attention. Omara "Bombino" Moctar was the leader of Group Bombino, and has now set out on his own. It's not the same tracklist as the earlier album, though it appears they share two tracks (though with variant spellings). Good. I have yet to hear the full CD, but from this advance single it sounds richer and clearer than the Sublime Frequencies album. Have a listen, or download this free track. And watch for Bombino touring the USA in June and July this year. I received the album in the mail last week thanks to a promotion the Cumbancha label was doing. After many close listens I still cannot believe how great this album is. Some songs are the same from the Sublime Frequency release but that is just fine with me. That was an awesome album. I wish they had left the camels in the background on the Tenere track from the original release though. Bombino is coming out of the shadow of fellow Tuareg (and personal favorite) group Tinariwen with fellow emerging artist like Tamikrest and Amanar. This is a great group of young artists, Bombino especially. It is a polished album with very few faults. I cannot wait to hear what he does in the future.